In just a week, I learned new skills, made new friends, and grew my enthusiasm for alternative living and the movement of ecovillages that supports it. From day one I felt welcomed and supported and my curiosity about how each of these members found themselves involved in this project was fed with diverse stories and a shared vision. As a volunteer, each day was different, which I really enjoyed because it allowed me to get a sense of the people and place as well as feel that I was contributing in some way. 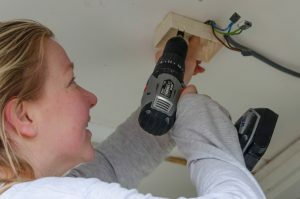 I learned how to install electricals with a very patient and passionate teacher. I carried wheelbarrows of soil to go under a house and insulate the plumbing. And on my day off, I shared a long walk through the forest to the nearby village with a walking enthusiast. Overall, I was most impressed with the general organisation of the project – each person has a clear role and communication is a priority. From daily check-ins to weekly team meetings, the process ran smoothly and I was grateful for the opportunity to see the range of what it takes to make a dream into reality. From administrative support to hands-on practical tasks, everyone is valued and respected and I felt a beautiful balance between peoples’ own lives and the common goal. Community members were honest about the challenges (mostly that they want to see the first permanent houses up and to be sure things will follow through) and dedicated to sticking with it because they genuinely believe in the final result. Though it also seemed just as much about the process as it was about the destination for some. Ecovillagers are bonded by this shared belief that another way is possible, and for a few days, I totally connected to this belief and hope to carry it through to my own next stage.